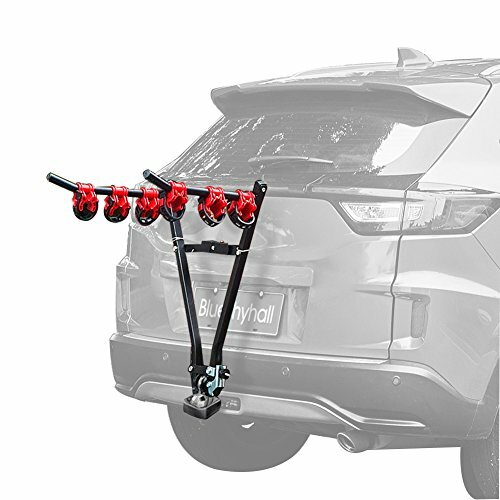 Traveling and cycling with your partner just got a whole lot easier with Blueshyhall Trunk Mounted Bike Rack. Fits most vehicles and carries 3 bicycles at the same time. Good for sporting or camping with your mountain bike, kids bike and even good for a day out in the sun by the beach with your beach cruiser. The bike rack doesn't impede your rear view, so you can be assured to have safe travels. Hitch mount rack made to fit a 2-inch trailer hitch. Fits most Sedans/Hatchbacks/Minivans and SUV's. Trunk mounted car rack to hold 3 bikes. If you have any questions about this product by Blueshyhall, contact us by completing and submitting the form below. If you are looking for a specif part number, please include it with your message.